There are a lot of ways Aaron Boone can fill the outfield and designated hitter spots in the lineup in 2018. Mind you, I'm sure some of these guys could play the other positions. For example, Judge or Stanton may be able to pick up left field just fine. I'm just listing guys in those places based on where they've played recently, and fairly often. When it comes to left field we have Clint Frazier, Brett Gardner, or Aaron Hicks. In center field there's Jacoby Ellsbury (did you know he hasn't played any other outfield position besides center field since 2010? ), Brett Gardner, or Aaron Hicks. And in right field there's Aaron Judge, Giancarlo Stanton, Clint Frazier, or Aaron Hicks. Furthermore, with his injury history, Boone will probably slot Stanton into the DH spot at least a couple of times a week. We'll also likely see Aaron Judge batting out of the DH spot at times, too, as this not only allows Judge to get a half day of rest, but it also allows Stanton to play right field (his normal position). Having options when filling out a lineup card is great, but there is such a thing as too many. First of all, it would leave Boone to constantly second guess himself, and be second guessed by others. He's already a first-time manager, so there's no need to make his job tougher. Every single day he'd hear something along the lines of "why didn't you start (insert name) instead of (insert name)?" Secondly, the Yankees are not going to carry six outfielders on their active roster. With only three or four bench spots available to them, usually depending on bullpen needs at the time, chances are only one of them will go to somebody that exclusively plays in the outfield. We've been hearing about ways the Yankees could trade Jacoby Ellsbury for a long time, but I just don't see it happening. Ellsbury has already said he doesn't want to leave the Yankees (damn that no-trade clause), and with three straight years of being a below average hitter, I don't see why anybody would want him... no matter how much of his contract the Yankees pay. There's also been talk of trading Brett Gardner. I think the possibility of this is better than with Ellsbury, but I'm not going to hold my breath waiting for news of a deal to happen. Brett's OPS+ the last three years is exactly 100, which means he's an average hitter. His ability to not only play a strong left field, but center field as well, is great. However, with only one more year on his contract, he doesn't come off as a guy teams are looking to "rent". Aaron Hicks would draw some interest, but I don't think the return would be enough that Cashman would seriously consider this possibility. Don't get me wrong, I like Hicks, as I believe what we saw in 2017 is more like the hitter he can be. And this Aaron can play any outfield position, and play them well. But would you trade anything significant for him? I don't think so. Perhaps if he has another season with the bat like he just had, but you can't forget 77 OPS+ he hit overall in his previous 1289 plate appearances. No... I'm not going to bother saying why neither Giancarlo Stanton or Aaron Judge would be traded. Clint didn't blow anybody away in his first taste of the Majors, but we're talking about a very good prospect (Keith Law ranked him 20th back in April). Frazier was actually the centerpiece of the group of players the Yankees received when they dealt Andrew Miller to Cleveland. At 22 years old he has plenty of prime years in front of him, and five of them will be under team control. So there's no doubt that a large handful of teams would try and get him from Cashman. The Yankees starting rotation currently includes Luis Severino, Masahiro Tanaka, Sonny Gray, and Jordan Montgomery. Severino looked like an ace last season, and isn't set to be a free agent until the 2022 offseason. Masahiro Tanaka had an up and down 2017, but he's closer to the 2016 guy we saw (when he finished 7th in Cy Young voting) than the one we saw last year, and he won't be a free agent until after the 2020 season. Sonny Gray is pretty darn good, especially when he gets some run support, and he's signed through the 2019 season. And while Jordan Montgomery would be one of the better pitchers on pretty much every other MLB team, he's currently the fourth best with the Yankees, and will not be a free agent until after the 2023 season. So the Yankees do not need another starter. They could easily just sign CC Sabathia, sit back, and smile at a pretty awesome starting rotation. But why do that when you can do something better? Why "settle" for Sabathia as the team's final piece to the rotation? Trade a nice asset, at a position overflowing with possibilities, and get another good to great young starter. Recently Gerrit Cole's name has popped up as a trade target. The Diamondbacks could use some offensive help, and have pitching to spare. The Brewers and Rockies also have some good starters but lack a bit offensively. 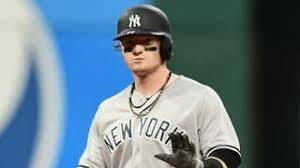 The fact of the matter is Clint Frazier is more valuable to the team as a trade chip than he is as a player. If Clint could play center field then we are not having this conversation. And if Stanton or Judge were not any good in the field, and thus should be relegated to DH, then we're not having this conversation. In fact, the only reason I can see holding onto Frazier is if the Yankees either can not get a good return in a trade, or they are convinced neither Judge nor Stanton can play left field. I don't believe that first part, but if that second part is true then hold onto Frazier to take over left regularly either this year after Gardner is traded or next year when Gardy's contract is up. I get your logic on trading Frazier logic aside I honestly hope they don't. Gardner is gone after this year and hopefully Ellsbury can be moved... please let that happen ths winter. I still see a package deal with either Hicks or Ellsbury and BETANCES maybe a low level prospect to make the deal sweeter to break the logjam and the trade would be for a starting pitcher. I understand your desire to keep Frazier, but the Yankees would still have three corner OFers for two positions. Yes, they could rotate Stanton and Judge at DH, and leave Frazier in LF. However, something about that doesn't sit right with me. Maybe because playing the field and hitting is different than sitting for 3 hours and only getting up to hit four or five times. Or maybe it's that neither guy has been a regular DH before (Judge started 10 games there last season, but that's it. Stanton... not at all). Oh, and no way do the Yankees get much of a starter for those three players. Ellsbury is not even average at the plate, Hicks had one good year and a number of below par ones, and Betances looked lost out there for most of the 2017 season. This off-season got started in a hurry. I agree with Bryan. Frazier is extremely expendable at this point. Trade Frazier, Acevado, McKinney, and Betances for Fulmer. Then flip Gardner for some low level but promising prospects. Resign (Todd) Frazier to play third and call your off-season done. I smell #28! Jeff...Fulmer is whom they should set their sights on. Young, under control for years, and could be a number one. Will those four players get a deal done ? I think your close. Frazier at third for three more years ? Thumbs down...Yes ! Jeff, No way do we trade "Ace" in a deal like that! He may well be a big part of the BP in 2018 and beyond...I hope! Gotta give something to get something. I'm not saying Acevado isn't a quality asset. I'm just saying I would rather have a stud starter providing 200 innings then a stud bullpen guy providing 50. Especially when we're loaded in the bullpen right now. I'm with Jeff here. I don't understand putting a POSSIBLE nice bullpen piece above a top starter. Not saying I agree with the whole package, but that piece is not the questionable part to me. I'm just curious Bryan. Who in that package do you not want to part with? McKinney or Betances? I was agreeing that putting Acevedo above a new young ace-like starter is wrong. Oh, I thought you had a problem with including McKinney or Betances in the trade. I was curious to hear your opinions. No. Although I think trading a guy like Betances, whose value is so low right now, is not what you want to do. was you who wrote it. Actually thought it was JimmyEatsHotDogs. Too much waffling in your message, otherwise not bad. I will admit to waffling. I try to keep an open mind, but end up not really taking a stand one way or another. Bryan, as wrong as I was about Stanton, I hope to be right on the...not trading of Clint. Clint can play CF but, he isn't a true CF'er for sure. Judge can play LF but, not in Yankee Stadium (to much ground to cover). So, we have a conundrum, do we hold on to Clint or trade him for something we need? 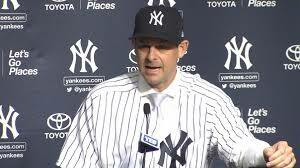 The good thing if we were to trade him is, we still have a solid bunch of guys to play the OF leftover lead by...Estevan Florial, Tyler Austin (1b/of), Trey Amburgey. But none have the power of Clint, yet! I like all 4 of these guys, all for different reasons...so I guess I like Clint a bit more! You'd do Frazier-Hicks-Judge in the OF and Stanton at DH? Of course alternate Judge and Stanton at DH. Bryan, I am not sure about the DH thing. We know, many every day players have never learned how to handle the DH spot very well...and the team suffered a lot. If we were to trade Brett and Ells (I have been THINKING...bad idea) Judge is not slow of foot at all but the extra running and area to cover...in left...may wear him down over a long season, then we get nothing out of him for the play-offs. I think that may be of some concern for Boone this year. Honestly, I don't know enough about Stanton to make a guess about his speed and abilities. So, I don't know for sure...now, that's classic Waffling!!!! You're a store brand waffle, while I'm an Eggo. It's not that I wouldn't trade "Ace" for an #1 starter, I am saying give up someone else other than him...speed, kills and one can't be taught speed. We all Know what "Ace" can be a starter or in the BP. He has been working as a starter but has people ahead of him so he will go to the BP first. I still don't like the way we are getting over balanced in the starting line-up. The Indians were one of the most powerful teams in the AL for about 5-7 years. They had power up and down the line-up but, they didn't have the guys to keep the line moving and just taking what the pitcher offered them...clutch hitting has more value than a 35 hr hitter at times. Look at this years games, how many did we lose because we had nobody that was a clutch hitter or even knew what it was...except little Torreyes! Yes, Torreyes was the most valuable player in the first half of the season or April/May anyhow. The balance of this team may suffer greatly because of having so much power. Where will we get a clutch hitter in this bunch of guys other than Yorreyes and Brett (somewhat) maybe DiDi can do it, hell, I know he can do it but would he choke up on the bat when he just needs a base-hit to score the winning run? Will any of the other guys do that? Not Judge, Stanton, Sanchez, Bird and Didi (I hope he will)...except for Didi, the other guys are payed for the HRs they hit not singles. Just an observation by an old man that, ain't got no learnin's nohow! Kenneth : Great point....14,000 men left in scoring position last season. Even worse, the past three seasons ! and whomever plays third base. Lets see the final roster first. * Kenneth...seven weeks until Long Beach Polar Bears ! that meet Jesus while performing. Build on to your legacy ! Those days are far behind me, and my legacy is just fine! I have been places that have no name and fought the fight. Now it is the new young guns turn to try the impossible (at times). I am a long way from New York now so, if I get wet, it will be in Lake Michigan not off your coast. Bye the bye, aren't you getting a bit old for that stuff? Keep the sun at your 6!